A quick and easy version of our favorite Americanized Chinese dish: pork fried rice. Now in a lightweight backpacking friendly recipe! We wanted to create something that would satisfy this recurring craving. As always with backpacking, weight was a major factor. But so was calorie count and the amount of protein. 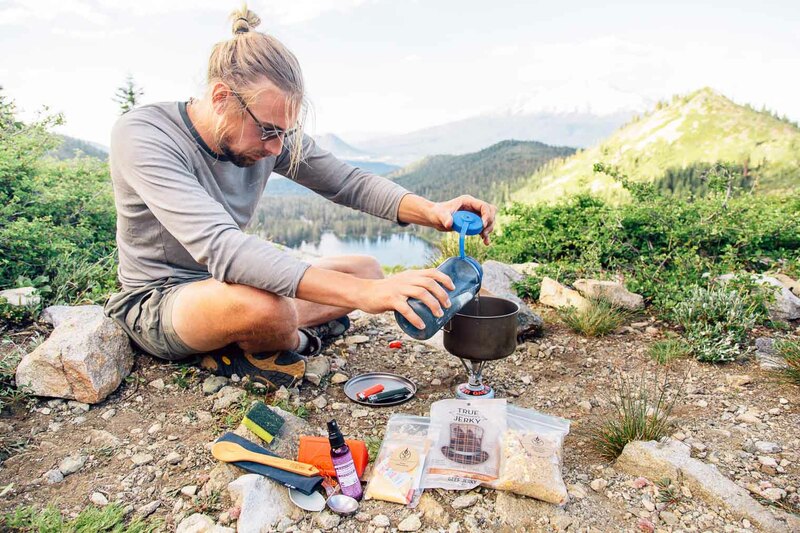 On top of that, it needed to be simple and fast, because the last thing any exhausted hiker wants at the end of the day is an Iron Chef-style culinary challenge. Taking all these factors into consideration, we wanted to develop a backpacking version of one of our favorite Chinese dishes: Pork Fried Rice. We started by testing a couple different kinds of quick cooking rice before decided to use Minute Brown Rice. During this process, we actually discovered that Minute Brown Rice is one of the healthier types of rice you can eat, due to its lower glycemic level compared to other rice. Brown rice already has fewer sugars than white rice, but the parboiling (actually, steaming) process used to make the rice “instant” actually forces a lot of the sugars out of the rice fiber. We wanted to incorporate some vegetables into the dish, so we picked up a package of dehydrated Just Veggies. It’s an assortment of bite-sized corn, peas, carrots, tomato, and bell peppers that plump up when they are cooked with the rice. While we initially wanted to use pork jerky for this, we came across a beef jerky that was just too good to pass up. We found out about True Gentlemen’s Jerky when we went to ExpoWest and from the first sample bite we took, we were absolutely hooked. Moist, tender, and packed with flavor. This particular style is a mango curry, which, we can assure you, is off the hook delicious! If you want to make this meal vegetarian-friendly, we have heard great things about Louisville Vegan Jerky Company’s products. And if you want to stick to tradition, you can easily use pork jerky – we originally tested this with Krave Teriyaki Pork jerky and it was super tasty. Lastly, there was the question of how to incorporate those little pieces of scrambled egg. The answer was OvaEasy powdered egg crystals. This lightweight solution only requires you to add a little bit of water to produce pre-scrambled egg mix. Not only does this complete our interpretation of a classic “Fried Rice”, but it also adds a good deal of protein to the mix as well. 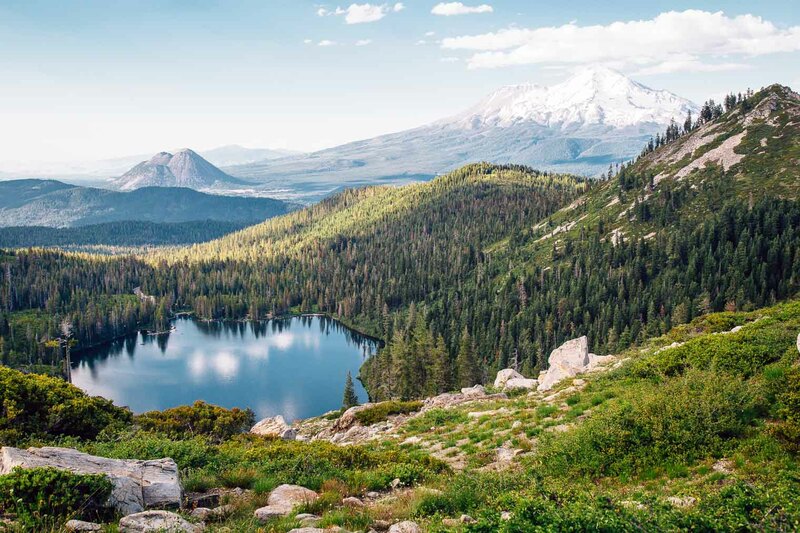 Mix in some seasoning, as well as a few packages of soy sauce, and that bowl of fried rice that you’ve been dreaming about for the past 6 miles can be a reality. OvaEasy Egg Crystals: We’ve had our fair share of backpacking “eggs,” and these really are as close to the real thing as we’ve found. You can find them on Amazon or REI. 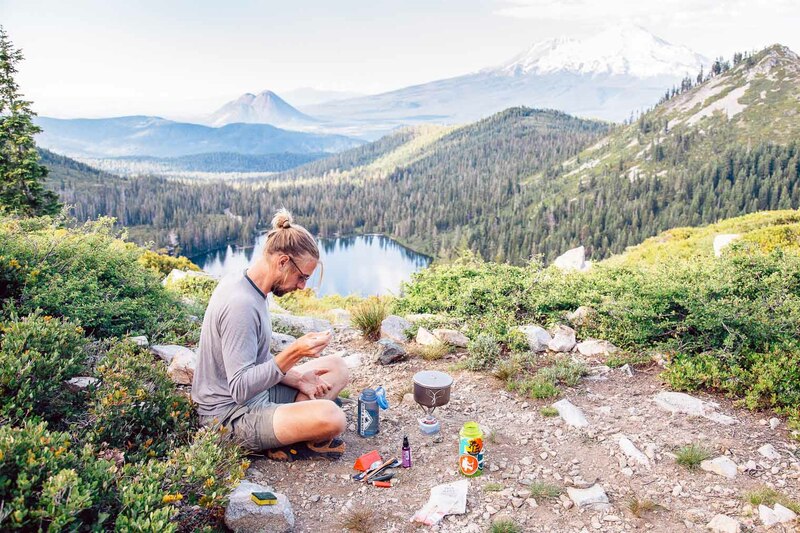 Just Veggies: These are a super easy way to up the nutritional value of any backpacking meal. You can find them on Amazon, REI, and we have seen them at Whole Foods. Brown Minute Rice: Available at nearly every grocery store. True Gentlemen’s Jerky: Available via their website or Amazon. Louisville Vegan Jerky: Available via their website or Amazon. Soy Sauce Packets: These can be picked up next time you order takeout, at many Asian grocers, or on Amazon. If you’re looking for a gluten free option, Amazon also carries single serve tamari packets. AT HOME: Add the veggies, rice, and salt to a ziplock bag. Place the Ova Easy in a separate baggie or small container (large enough to be able to add water into at camp to mix it up). AT CAMP: Bring the water to a boil in a cook pot. Add the rice, vegetables, and salt. Turn the heat down to low, cover the pot, and simmer 6 minutes. Take the pot off the heat and allow it to sit, covered, an additional 6 minutes. Make a small well in the middle of the rice and add the egg. Put the pot back on the burner over low heat and stir the eggs to scramble, about 2 minutes, or until cooked and there is no liquid egg remaining. Add the soy sauce and jerky and stir to combine. Dig in! Substitute jerky with an alternative such as Louisville Vegan Jerky. Omit the egg and substitute jerky with an alternative. 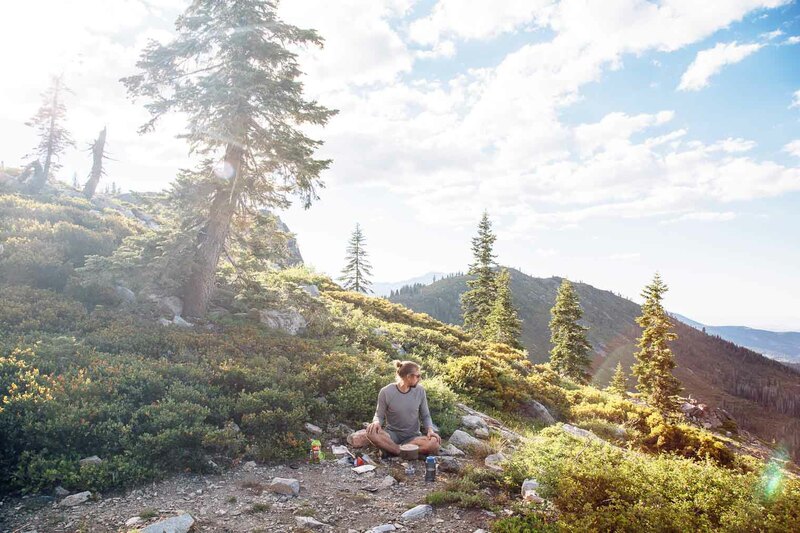 What foods do you find yourself craving the most when you’re in the backcountry? We’d love to hear about them – and perhaps come up with some lightweight recipes so you can satisfy those cravings on the trail! I bet it’s tough to find vegan backpacking food! I’ve been trying to think of vegan backpacking recipe ideas to create for this space and it’s definitely a challenge. The views were phenomenal. I could spend days hiking up there!! For backpacking more than a night it can get heavy or I just eat alot of TVP sloppy joes lol I’ve brought corn on the cob along before too haha. Car camping is a bit easier but sometimes all the recipes are realllllly similar! I really need to explore more of the PNW!